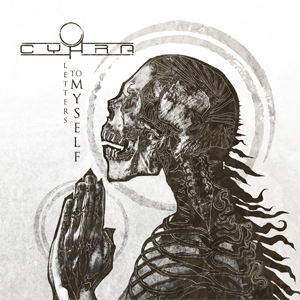 CYHRA, the new band featuring former AMARANTHE singer Jake E. and ex-IN FLAMES guitarist Jesper Strömblad, have revealed details of their forthcoming debut album, Letters To Myself. The album is available for pre-order HERE. Due for release on October 20, Letters To Myself features plenty of the magic that each member of the band has become known for over the years. CYHRA have shared the first single, "Karma". Listen to it below. The video will follow on September 8. From the blissfully melodic thrust of Strömblad's riffs and hooks, and the soaring, soulful splendor of Jake E.'s unmistakable voice, to the pummeling, groove-driven precision of Peter Iwers, and Alex Landenburg's rhythmic bedrock, every last moment crackles with the excitement of fresh territory, new challenges, and a brand new identity for all involved to embrace. Formed in 2016 by long-time friends Jake E. and Jesper Strömblad, CYHRA are about to light a fire under the contemporary metal scene that promises to blaze for decades to come. With former IN FLAMES bassist Peter Iwers plus Alex Landenburg (current drummer with power metal titans LUCA TURILLI'S RHAPSODY and a former member of thrash legends ANNIHILATOR) completing the line-up, the buzz around CYHRA has been growing at a rapid rate since the band unveiled their plans earlier this year. "The excitement that I feel about CYHRA is over the top," Jake E. exclaims. "I have to pinch myself every day to make sure it's not just another dream. I am so proud of the music we have created and I can't wait to show it to the world!" "For the first time for as long as I can remember, I feel I am a part of something special," adds Strömblad. "This band has helped me regain my true passion for music. I can't wait to share this." The band plans tour extensively behind its Spinefarm debut. The first show is scheduled for October 27 at Nosturi in Helsinki, Finland.